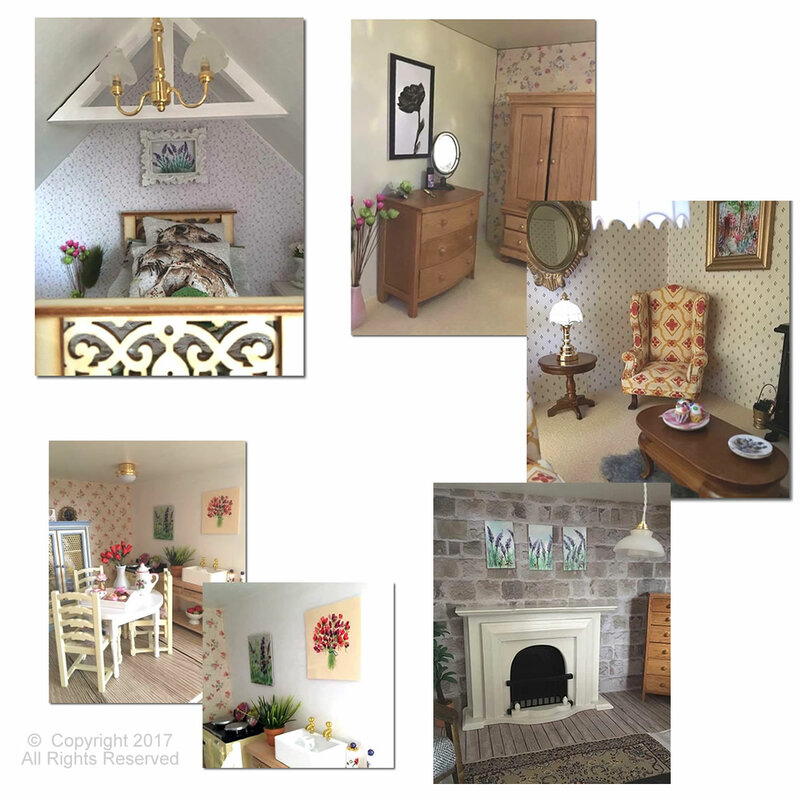 As you may know my miniature dolls house art paintings are very popular, they are all over the world and grace walls in doll houses and miniature properties from Manor Houses to country cottages and Tea shops and boutiques to Grand houses. But my tiny miniatures are also owned by collectors of miniature art, I have seen photos of them displayed in many ways, on shelves, on stands and easels, in frames and as ornaments. I also sell ACEO size Art card miniature which are a special format size art which it 2.5 x 3.5 inches. Which are collectible artworks. Art makes a great gift for Christmas. I have been told over the years of many of my paintings (large and in miniature) have been given as gifts and I think this is a great honour to have my work shared in this way. But Do you hesitate when thinking of Art as a gift? “How will they display it” or “Where will they put it”, this is a good question, not everyone wants to be drilling walls to hang paintings, so what about a miniature painting? Not just as small as a tiny dollhouse piece maybe – unless you want a gift for a dollhouse owner of course ? but a miniature ACEO size collectible original art work 3.5 x 2.5 inches or one of my A6 size pieces can be displayed on a stand or mini easel. This makes the artwork movable and as much an ornament as a piece of Art. Art provenance is the history of a piece of art / painting, and how it was created and the ownership thereof. So buying direct from the artist gives you the knowledge of where your piece of art has come from. 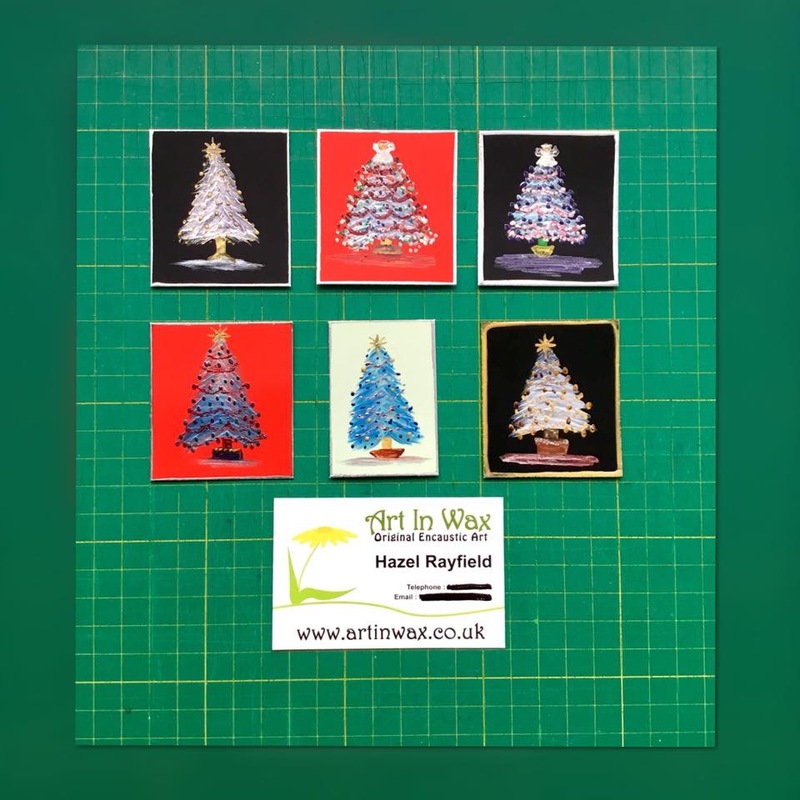 As all my Art In Wax have been painted by me Hazel Rayfield you know where the painting has come from and have contact with the artist, my paintings are signed and dated on the back, some also have my initials in the wax too. 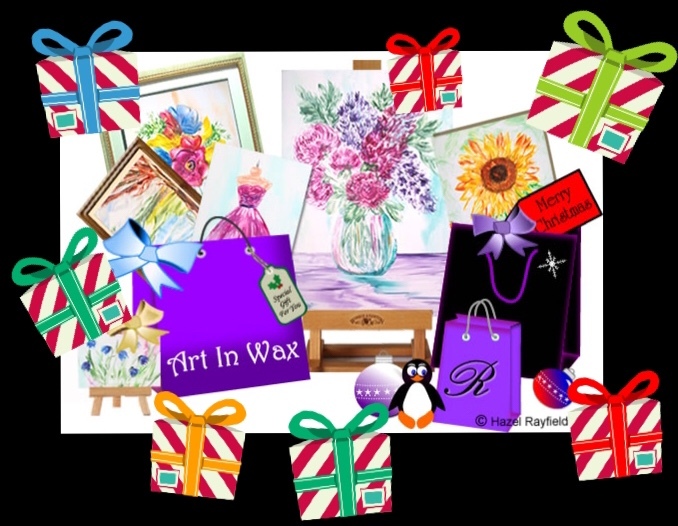 Each painting comes with a leaflet which can be included in with the gift giving the recipient more information about Art In Wax. I have lots of paintings online in my web shop and in my Etsy store, so lots of choice, from flowers and landscapes to birds like my new Toucan pieces, hummingbirds, parrots and peacocks, and much more !!! I also do commissions if you want something special painted for Christmas just get in touch. Each of these new Christmas tree paintings is unique and original. Painted in encaustic Wax paints my Art in Wax pictures have a lovely texture and sheen and especially as they have a lot of silver, gold and metallic paint. They are not yet listed online so to buy comment or contact me via my web form and we can arrange the sale. Payment via PayPal. NB These are Collectible miniature art – not suitable for children. Miniature Art In Wax @ Home ….. I love to see my art in their new homes and quite people often send me messages or we connect via Facebook or Etsy and show me photographs of the pieces of my mini art they have bought and how they are on display in their dolls houses or miniature properties. Miniature Art for Dolls Houses but Not Just For Dolls Houses ! 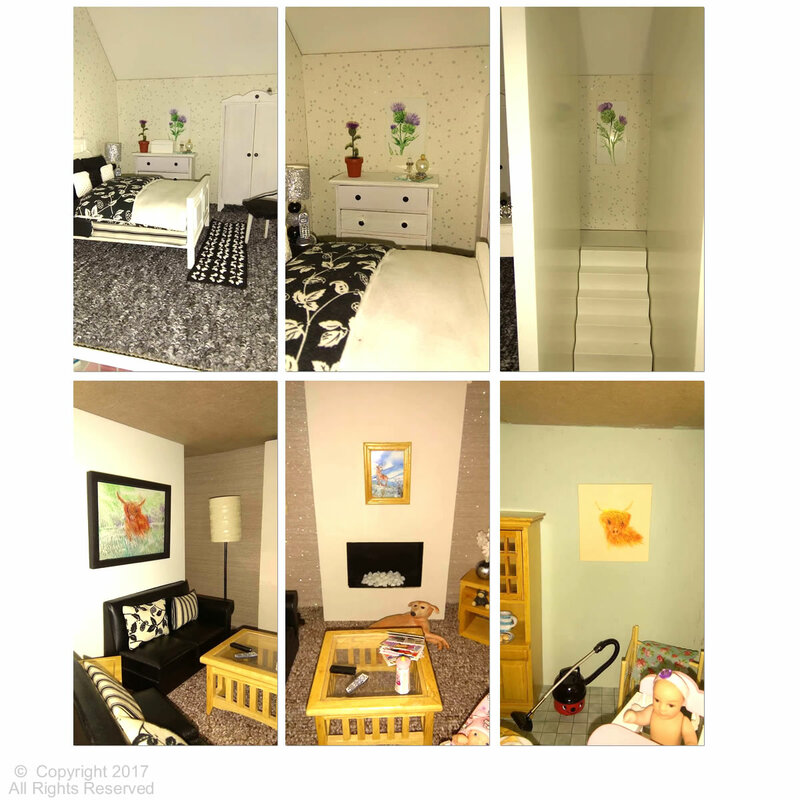 This post shows some more miniature properties with paintings on display and also how my miniature art is “not just for dolls houses”. I am very fortunate to have collectors of my miniature art whom have miniature art collections. I know from communication with collectors, some of whom I have got to know very well and are friends now, sharing a passion for all things miniature, that my art is displayed in many ways from dolls houses to room boxes and in albums, on display shelves and made into collectible frames for the wall. I too have miniature art on display in this way. As you may know if you have read my blog I have my own miniature 1 :12 scale property – an Art Gallery which is a Victorian double front shop with a contemporary interior called The Gallery. I also have miniature art on display on miniature easels on shelves in our lounge, my office and of course my studio. Some of the owners of my mini art have given me permission to show their photos here on this blog post today. Thank you everyone who has contributed. My art is sold worldwide and below are some photo from both local and international collectors. Lesley from Scotland has several pieces of my art In here house, the thistle, stag landscape and the highland cattle, which was painted as a commission for her, look great in her house. Alison in Essex has dolls houses but is also a collectors whom love to display my art in different ways has made the frame below to display some of her collection of Art In Wax. 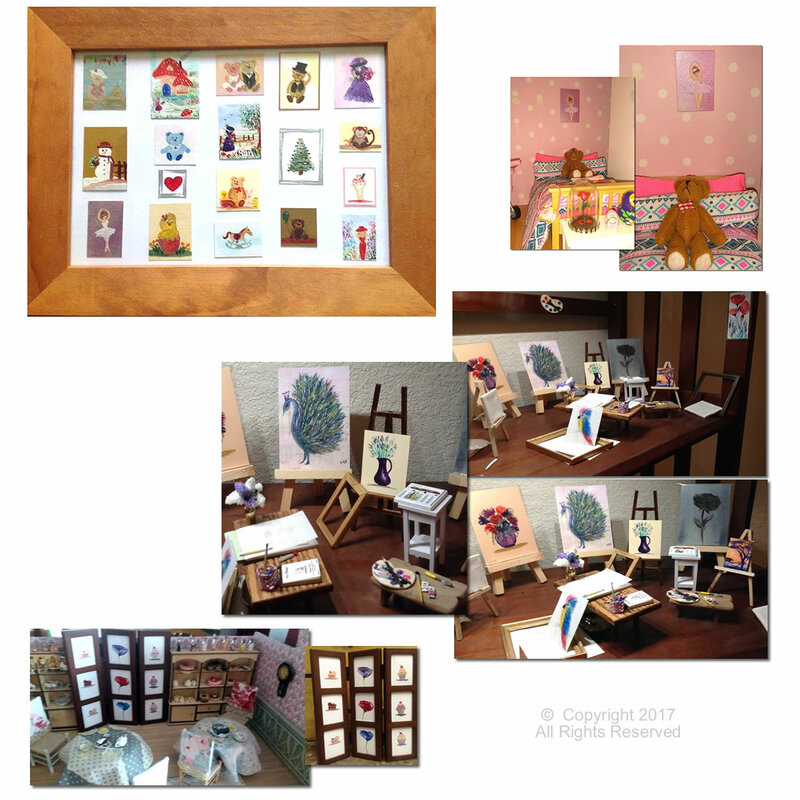 Some of these pieces are very unique as Alison commissioned me to paint specifically for her collection….. including a very cheeky monkey !!! The artist studio set below with lots of paintings including a peacock and exotic birds is not a dollhouse house but a shelf. Susan in Washington state USA has this collection of my art in a very cleverly put together “set display” on a shelving unit in her home. It is very effective and I love the idea of creating a set from miniatures like this. Jan had the paneled frame style screen (shown below)and asked me to paint pictures to go into it, with a theme on poppies and cakes for her mini cafe. Sam has several dollhouses and here shows us one of her houses with my art on display. The detail of her houses is wonderful, I especially like the bedroom with the framed lavender painting over the bed and the sweet-pea bouquet in the lovely kitchen. Thank you again everyone who has let me see their Art In Wax in there new homes. My latest Commissioned painting was for a Hummingbird !! 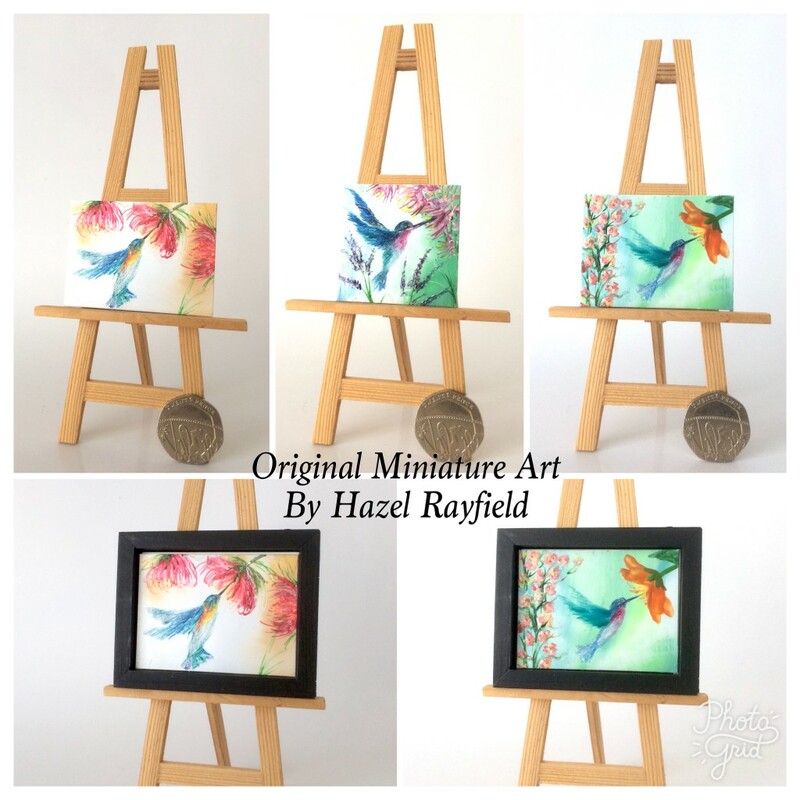 My Original miniature dollhouse art is very popular and this week it has been all about the birds ! Hummingbirds in fact. 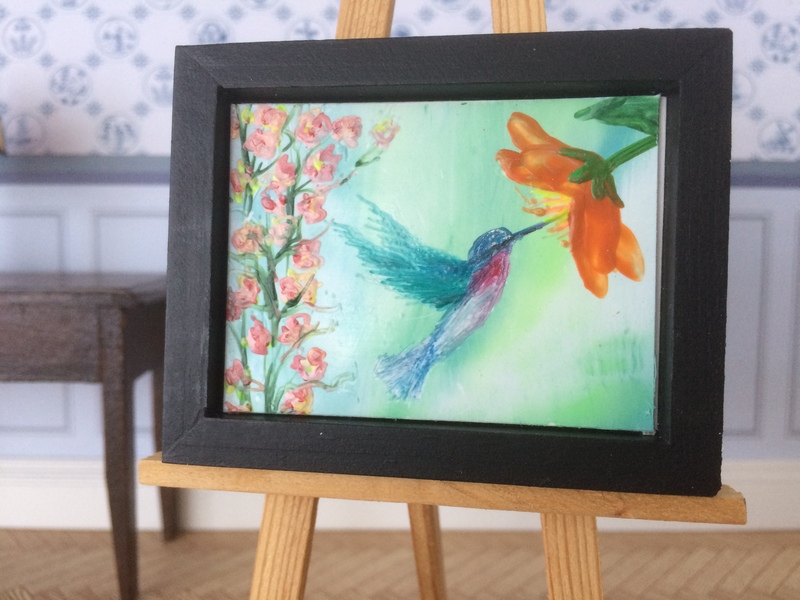 The orange flower hummingbird miniature painting is my latest commissioned piece. A lady who owns a couple of my paintings and whom I met a couple of years ago at a dolls house fair in Essex, found my Etsy store online and, having seen a hummingbird painting that I had recently sold contacted me to ask if I could paint one especially for her. I painted more than one for her to choose and supplied it in the frame shown. The frame is wooden handmade frame I had bespokely made for me by a craftsman here in the UK and is 2 x 2 1/2 inches in size. Inspired by these tiny paintings I decided to paint a larger piece of Art In Wax …. 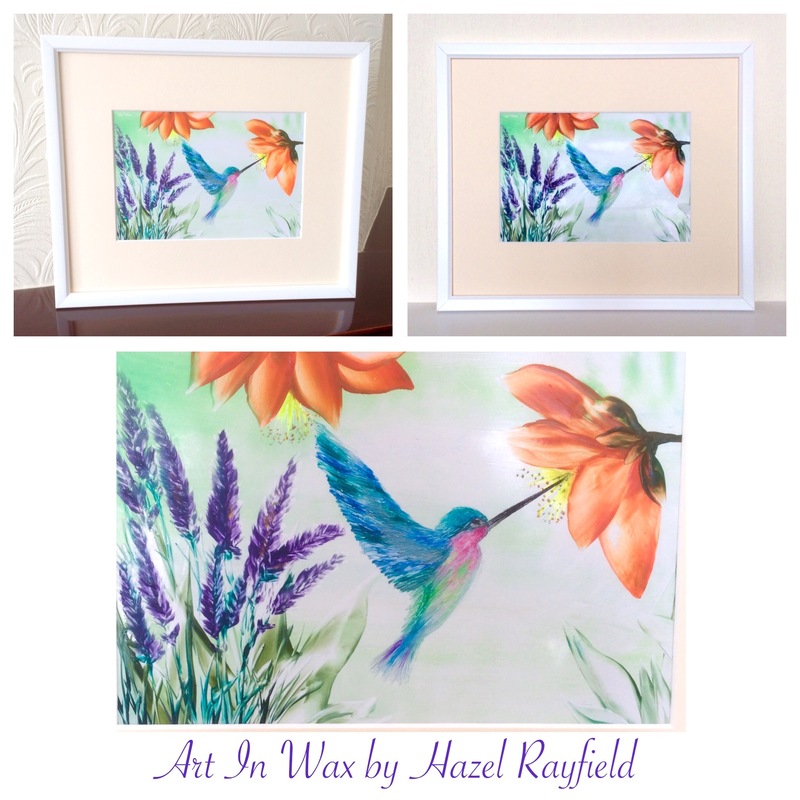 This hummingbird painting is also painted in Encaustic hot wax paints on an A5 size Encaustic card support and is shown here mounted and framed to 10 x 12 inches.